I hit the wall two weeks ago. I had to make a decision – either go out and buy a new tent wardrobe or lose weight. I thought I chose the cheaper of the two, but since there’s no “last call sale” for iceberg lettuce, I may have been wrong. Vegetables are expensive. Because I’ve been on every diet in the world (yes, even that stupid grapefruit and egg one) it’s really hard be motivated again. So I decided on the one diet I’ve never tried – Weight Watchers – because my neighbor has been on it for months and she’s a shadow of her former self. Plus, I’ve seen so many Weight Watcher commercials this year; I’m brainwashed. My head’s so full; it’s probably gained weight, too. The fact is I’ve gone for the program hook, line, and sinker. No, I haven’t attended meetings and become a dieting zombie. I did it quietly on my own armed with an amazing app. 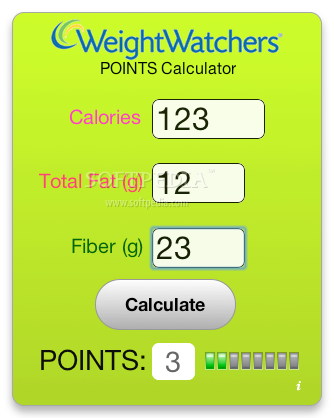 With the Weight Watcher’s App, I am in control of my universe. I can zap things, push things and wiggle things. I wish I knew a man who could do that much for me. If you are not familiar with the diet, WW is based on a point system. You have to manage your points and not go over your magic number. Basically, an ounce of cheese is 1 point, a great steak is 5 points and Thanksgiving dinner is 9,327. I’ve never been escorted out of a grocery store before. Besides the points you get for food, you also get “activity” points. No, this doesn’t mean you earn precious points for changing the channel with the remote, it means you must get up and move to earn points. Did you know you can earn a point letting three cats and one dog in and out the door all day long? Well, at least you should be able to. Now I carry my phone everywhere and if I even think about food, I look up what I’m craving, read the points and feel like I’ve eaten something. When I walk to the bathroom, I count it as an activity. That’s why drinking water makes you lose weight. Now you must understand that Stroke is skinny. He always has been. Heck, when he turns sideways, you can’t even see him. His favorite dish is Fritos & Pimento Cheese Au Gratin. SOG has never dieted one day in his life. So, I tried to explain the points system, hence my love of the app, but it was to no avail. He had that faraway “football-season-is-over-and-I’m-going-to-die” stare. Then he shook it off, announced that my face look thinner and started to flirt. I grabbed my loyal app companion and went straight to the list of activities that would earn me points. No problem. It appears I earn 1 point for every 10 minutes I do squats with a dumbbell. Spreading laughter around the world…1 point at a time.